We pedal on. Broken bike, frozen fingers. What else we can we do? We pedal and I listen for the rumble of an engine behind us. If it's loud enough, I look back. If it's a truck, I shout to Lauren and we hop off our bikes and stick our thumbs wildly in the air. It's a quiet road on an even quieter day. We don't get many chances. There are few vehicles and most can't carry us. Those that can won't. We pedal on. A big white van tears around the corner behind us. We dismount and flail our thumbs, but half-heartedly at this point. We already feel defeated. We know it won't stop. And then, the screech of wet brakes on wet rims. Wet tires on wet ground. The flash of a turn signal. The crunch of gravel as the van glides into the shoulder. Doors opening and a man rushing toward us with dry towels for our wet bodies. It's a few hours later and we are warm and toasty in the cozy home of Paqui and Ricardo. Our clothes are tumbling in the dryer and we are seated around the table drinking tea and eating leftover cake from Three Kings' Day. We are so thankful. Ricardo is a cyclist. He's the mountain biking kind, the kind that's so into mountain biking that he has a van to transport him and his bike to the gnarliest sections of the Sierra. A van that, consequently, can fit two big touring bikes and four panniers and two soggy travelers stranded in the mountains on a day like today, when no one should be doing biking of any kind. We cyclists need to help each other out, he says when we thank him. We've been driven about a dozen kilometers up the road to the pueblo of Santisteban. After drying us and feeding us, Paqui and Ricardo help us make sense of these bus schedules we're looking at. There is a bus leaving for Valencia, they tell us. Tonight. Why, we just might make it to Valencia after all. It leaves from Villacarrillo, about twenty kilometers south of here, at 9:15PM. They think we can take our bikes aboard without too much trouble. It'll drop us in Valencia at about two in the morning. I check the weather for Valencia. It'll be warmer in Valencia at two in the morning than it was in Arquillos at two in the afternoon. We check the time an hour or so later and figure we should be going. 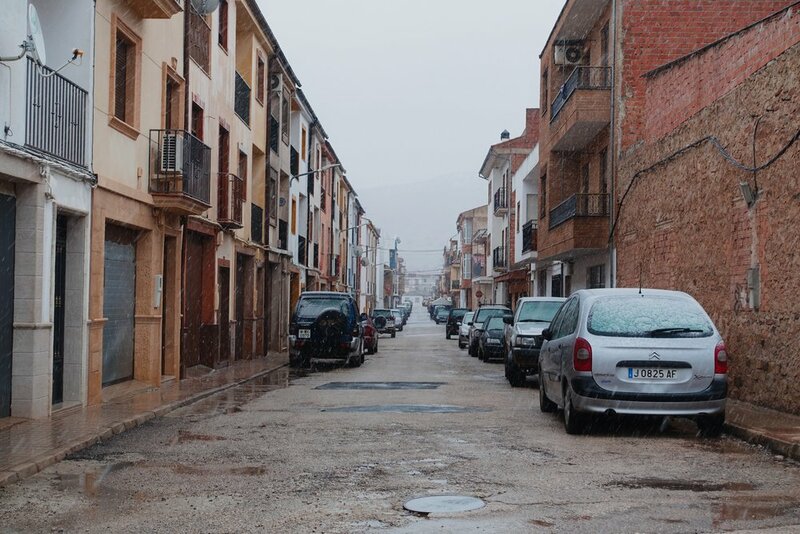 It'll take a few hours to reach Villacarrillo, which is very unfortunately on the other end of a steep valley, and will probably take even longer given the snow and the dark. We rise to pack our things. No, no, no, Ricardo says. You can't be biking in weather like this. Stick around, and I can drive you later. We insist that they've already done enough for us. There's no way we expect Ricardo to take an hour away from his girlfriend and his son on the evening of Three Kings' Day to drive two strangers and their muddy bikes down a steep winding road in the snow and the dark, then up the other side in the snow and the dark, then all the way back home alone in the snow and the dark. We arrive in Villacarrillo. It was a harrowing drive here, and I suppose it would have been damn near impossible to cycle it in these conditions, especially given Lauren's misbehaving wheel. We arrive early to ensure there's time to fit our bikes on the bus. We tell Ricardo it's okay to leave, that he should head back and be with his family before the road gets too icy. But he wants to be sure we've made it safely aboard. He'll wait with us. It is 8:45 and there is no bus. It is 9PM and there is no bus. The bus's website says to arrive fifteen minutes prior to departure, but the bus itself has not arrived fifteen minutes prior to departure. We pace around the terminal anxiously. Are the buses even running today? At 9:16 the bus arrives. It should have left a minute ago. And so everything is a little frenzied. The bus driver gets off and shouts at the few passengers milling about the station to board, and board quickly. Ricardo approaches him and asks about the bikes. The driver is visibly peeved. Pues, vale. Pero rapido. Rapido. Well, okay. But quick, quick. We rush to the van to get our bikes. We're going to Valencia. We're going to Valencia! We hurry them over to the bus and begin pushing them toward the underside storage. No, the driver says. He looks at them with disgust. My heart sinks. Ricardo interrogates him in rapid-fire Spanish. Everything is moving very quickly. The driver is fiddling with his keys. He knows he's late and he knows we're just going to make him later. "You have to take the wheels off," Ricardo tells us. "But do it quick. He doesn't want to wait." Taking a wheel off a bike is an easy job. In a relaxed setting, it might take ten or fifteen seconds. But this is not a relaxed setting. My hands are shaking. The skewer is wet from all the rain, and my fingers keep slipping as I try to turn it. Rapido, rapido, the driver calls over. I want to tell him that telling someone to go fast does not make that person go any faster. Usually it does the opposite. Nearby Lauren and Ricardo are working to disassemble her bike, too. The driver stamps his foot and says something snippy to Ricardo. Ricardo drops his hands and stands up. "It's done," he says to us. "He won't wait. It's okay; we can all go back to my place and see about a bus tomorrow." We're ... not going to Valencia. We already checked the bus schedule to Valencia tomorrow. There are no buses. This is the last one for days. We are going to Valencia. I stand to face the driver. "Señor," I plead forcefully. "Por favor. Un momento. UN MOMENTO, señor. Por favor." My Spanish isn't pretty, but it gets the desperation across. He sighs. We get our momento. The wheels come off, and we toss the bikes underneath the bus before he can change his mind. We are this bus driver's worst nightmare. We think the bus drama is over. We round the bend of the coach and give an all too hurried goodbye to Ricardo, and then we climb the stairs of the bus and give the driver our destination and when he tells us it'll be sixty-three euros for the two of us, we hand him our card. He looks at it like we're handing him an avocado as payment. Um, he does not accept credit cards on this bus. Cash only. There is nowhere to buy a ticket with a credit card in the station. We've already checked. Though we usually carry more cash, we don't have sixty-three euros on us. There are no ATMs. We checked that, too. Europe is credit card country. We didn't expect to need cash in a situation like this. We are on the bus. Our bikes are on the bus. We have the money. Just not in cash. We are so, so close. We are not going to Valencia. And then, Ricardo appears in the doorway. He thrusts a hundred euro note into Lauren's hand. Aqui, toma. He gave us his phone number earlier. He tells us we can message him when we get to Valencia and get the details we need to transfer the money back to his bank. But for right now, just go. We live in a world where strangers will pick each other up off the streets. We live in a world where people will bring other people into their homes, feed them, and drive them up and down a snowy mountain in the depths of a winter's night. We live in a world where people will hand strangers they've only just met one hundred euros with nothing but the implicit request of please don't screw me on this. Yes, there's a darker side to this world. Yes, we also live in a world where people shoot at other people for no reason. We live in a world where people sometimes can't agree, and where people sometimes do terrible things to those they can't agree with. We live in a world with a whole lot of human suffering, most of it caused by the way humans treat other humans. Mostly, we live in a world where how you live is dictated largely by how you trust. If you do not trust others, if you believe human nature to be something dark and rotten, you close yourself off to a whole lot. If you do not open the shutters, all you get is darkness, no matter what's outside. True, you may get darkness even if the shutters are open. Darkness or something worse: a rock hurled through your window, a tree branch kicked up by violent winds. But there's no way to let the light in unless you open your shutters to the wider world. And sometimes, that light can be pretty blinding. We have made it to Valencia. It is three in the morning and it is positively balmy. It is dry and the skies are clear. It is nice to be here. Our plan was to just hang out in the station for a few hours until daybreak. But it has been a long day. It has been a very, very long day. We cash in some of our use-in-case-of-emergency hotel points and book a room at the Marriott downtown. We reassemble our bicycles in the bus depot and pedal the four or five kilometers across town in the dark. Lauren's bike yelps with every turn of the pedals. We reach the hotel. Check in. Beg for late check-out and get it. We park our bikes in the garage and carry our things upstairs and take off our clothes and collapse into the bed. We sleep, and we sleep very, very well. We awaken around noon on the eighth floor of the Marriott to clear blue skies and sun streaming in through the room's three large windows. I open one of them and feel the air outside. It is warm. We really haven't seen a blue sky since Morocco. We marvel at it. We shower and slowly gather ourselves together. Around two or three in the afternoon, we wander downstairs to check-out. We have alternate arrangements tonight. We'll be staying with another pair of Warmshowers hosts, a couple kind enough to agree to house us for two days and also to put up with our multiple changes of arrival date as we bumped our way through the Spanish interior. Obviously we were not going to arrive at their doorstep at three o'clock this morning. A mid-afternoon meeting felt more appropriate. Vicki and Tony are lovely. They're the first pair of bicycle travelers we've had any sustained interaction with since the very first day of our trip. A few years ago, they spent a year cycling from Europe to India on a route not terribly dissimilar from the one we'll be taking east. We pepper them with questions about their journey. We meet their daughter. She, they tell us, is the happy reason their bike journey came to an end. It's hard to wake up in a tent each day with morning sickness. She is small and shy and adorable. Vicki and Tony are really cool parents. Like parents we might hope to be some day. They ride around Valencia with little Elena strapped in a kid's seat on the back of Tony's bike. They're young and energetic and amazing cooks. They hope to open a restaurant, and treat us to a number of delicious, homemade vegan meals worthy of the aspiration. On our second day, Tony helps Lauren and I diagnose the screeching on Lauren's bike (two broken disc brake retaining clips), and we swap out her worn brake pads for fresh ones. Later, Vicki escorts us to the bank so we can wire Ricardo and Paqui their hundred euros. Sunshine. Warmth. Good company. A great city. We like Valencia so much that after saying goodbye to Vicki and Tony and thanking them for their tremendous hospitality, we dig a little deeper into our use-in-case-of-emergency stash of hotel points for a not-really-an-emergency-but-the-points-to-dollar-ratio-here-is-just-too-good-to-pass-up second night at the Marriott. We lounge around the room. We go for a bike ride through Valencia's awesome river-turned-park. We go shopping and finally, finally replace our terrible gloves with gloves that I can now describe as waterproof without putting quotes around the word waterproof. They feel warm and trustworthy. Never again will we let ourselves end up where we were a few days earlier. Next time, no matter what else happens, our hands will be dry. It's January tenth. Four hundred kilometers lie between us and Barcelona. And we must be there by the morning of the 15th.